Let´s start learning vocabulary and you can also continue with all these exercises during your vacations. Today we will learn how to read newspapers. Learning edge will help us discover a new way of reading!! 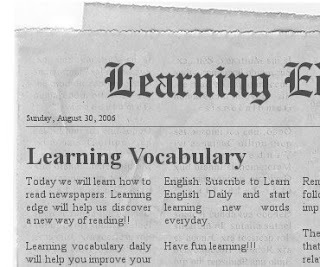 Learning vocabulary daily will help you improve your English. Suscrbie to Learn English Daily and start learning new words everyday. As homework please read the following and answer the questions. Today we will continue practising Comparatives and Superlatives. Take a look at all the exercises below and Good Luck!!! Today I will give you a wonderful table where you will find all the necessary explanations on how to use tenses. Take the following test to see if you understoond the table.Good luck!!! Here you will find a Quiz on Nelson Mandela and in this site there is a very short article on Nelson Mandela. Agus today we will take a look at a great site where you will find many different activities. You can read books, learn the alphabet and play games.